Recreating what was a turbulent experience for the original artists, Canadian band The Musical Box are bringing their version of Genesis’ ‘The Lamb Lies Down On Broadway’ stage show to the UK in March 2012. We hear about the challenges and the responses the show provides from the group’s bassist, Sébastien Lamothe. S] How are you feeling today? S] Where did the idea to stage ‘The Lamb Lies Down On Broadway’ come from? SL] “The Musical Box mission has been to re-enact and reproduce, in exact historical detail, early Genesis concerts. I guess in some ways we’ve been glorifying their early works. We have worked on several of their albums from the 1970s: ‘Selling England By The Pound’, ‘Foxtrot’ and ‘Nursery Crimes’. S] The show has been officially licensed by Peter Gabriel and the other members of Genesis. How does it feel to receive their endorsement? SL] “We could never imagine being able to re-enact such a performance without their help; they’ve been so supportive. We’re all about making the experience as real as possible in terms of history. Without their support, there’s so many facts and details of the we simply would not nail. Genesis had a strong slide projection system with images supporting the whole concept story during the concert. We had access to the original slides; without this, it would really make the experience less accurate. 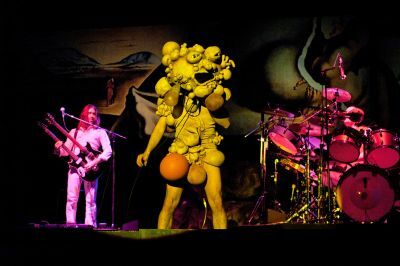 Genesis never officially filmed the show; it’s a mysterious piece of work. People were witnessing a dark and strange concept show; they had no idea what they were listening to, they were not familiar with it. This show was really misunderstood in so many ways, so we’re happy to bring it back on stage so people can really see it for what it was. S] Was the process of gaining the approval of Genesis and Peter Gabriel easy? S] Do you still find yourself learning about your craft as a musician? SL] “The progressive movement in the early 1970s, this was performance music. Since we’re putting ourselves in the same position, using original instruments and equipment – forty years ago, these systems were brand new; now they are vintage, they’re sometimes problems. It makes the experience very real, but the performance very risky. Sometimes there are mess-ups; one instrument will start breaking, one image may not display right – when this stuff happens, we’re smiling, because we know that’s just part of the experience. S] How has the show been received by those who’ve seen it so far? S] As a performer, how important is it to you to hear what the audience thinks of the show? SL] “We exist because of the audience and their interest in our passion. The fact they are acknowledging and appreciating all our efforts, it’s a binding experience as we know that’s what they are coming to see and get. It also forces us to keep it up. S] How does your connection with the other members of The Musical Box develop through each performance? What’s the group dynamic like? SL] “We are a family. We’re all together for long periods of time away from home, and everybody’s mind is dedicated to one thing: to bring the original performances on stage as best we can. It’s a group effort, and with such intensity, the interpersonal aspect is a part of it. There has to be some kind of connectivity between what we do. S] Did you find a common bond with Genesis when they supported you? SL] “We are, in some ways, showing respect for what they do; we are still forcing them to relive some of their past moments, when they were much younger. Sometimes, we are confronting them with moments of their past which are not necessarily their happiest moments. S] Do you anticipate a different response to the show from European audiences to how it’s been perceived by North Americans? And is this the first time The Musical Box has performed in Europe? S] Why do you think the ‘The Lamb Lies Down On Broadway’ album is held in high regard by music fans and critics? SL] “We can try to break it down and make these crazy analyses about it, but deep down for me, when we are taking about a complete body of work, it’s my favourite album by Genesis. I think, even if they changed the format, all the songs are extremely strong, and the connectivity to one and another in the story is pure genius. I think at the time, the guys in the band were on a huge wave of creativity and very much at the top of their game. S] When your European tour finishes, what’s next for the show and for The Musical Box? S] Do you have a message for people in the UK coming to see ‘The Lamb Lies On Broadway’? More information on The Musical Box and their adaptation of ‘The Lamb Lies Down On Broadway’ is available on the group’s website.